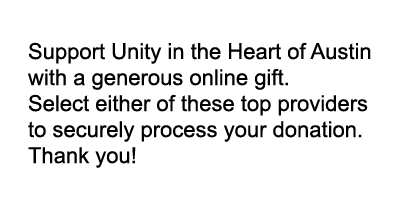 Welcome to Unity Heart of Austin! Cookies are small files stored on your device by our website. They contain information to make your future visits to our website a better experience. Our partners including YouTube, DailyWord, Facebook and PayPal may also put cookies on your device. Click Accept to hide this notification for one year. Unity in the Heart of Austin is a "new thought" Spiritual community in South Austin that meets Sundays at Galindo Elementary School. Located in Austin's 78704 zipcode we are near SOCO, SOLA, Travis Heights and St. Edwards University. We are easily accessible from anywhere in Austin. We strive to be Spirit-led, inspiring, loving, joyous and transforming. We believe God is not "out there," but within each of us. Each of us is an individual and unique manifestation of The Christ Within, the eternal essence of God that is our true spiritual nature. Looking for a church to call home? Give us a try. We know that your past church experience may have been negative or just plain boring. At Unity in the Heart of Austin we provide a positive, informative and uplifting experience, ideas you can use to improve your life, and opportunities to serve in a community that works to make a positive difference in our city and our world. We also have music that's easy to sing because you already know the words, lots of opportunities to be of service, and a history of loving fellowship. Sunday Service starts at 11:00 AM. The service runs about an hour. Youth Education (our name for Sunday School) is at the same time. Dress is casual. And, we hope you'll stay afterwards for some great refreshments and make some new friends. 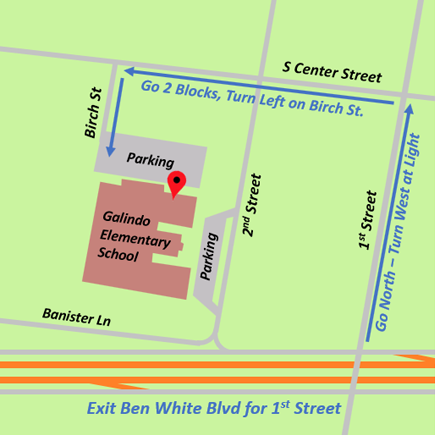 Our Sunday Service is at Galindo Elementary School just off Ben White Boulevard. The school’s address is 3800 South Second Street. If you park in the front parking lot walk down the right side of the building to enter the cafetorium. You can also set your GPS for 3709 Birch Street to arrive at the school’s side parking lot just outside the cafetorium door. Need help navigating the from Ben White? Click the green box. Click the icon above to select from our library of 200 talks. Click here to go to our virtual bookstore. There you'll find how to sign up with the Amazon Smile program. Then, our church earns a small commission on many of the things you buy at Amazon and it is completely private. You'll also find suggestions for items you might like to buy as a gift or for yourself.